This is an official product, our own clients products are printed using the latest technology using quality Gildan garments. 3rd party supplied items are printed using several processes including screen printed, digital direct or embroidered. Please contact us if you have any questions regarding our products. The Ruts formed in 1977 are a Punk Rock band from London. Combining straightforward beefy Punk tracks, such as Babylon is Burning and In A Rut with Dub Reggae classics like Give Youth A Chance and Jah War, they were most similar to The Clash in terms of stance and influence, walking the walk and talking the talk. After meeting at the Deeply Vale Free Festival, The Ruts were formed on 18 August 1977, the band consisted of Malcolm Owen (vocals), Paul Fox (guitar), John "Segs" Jennings (bass) and Dave Ruffy (drums). 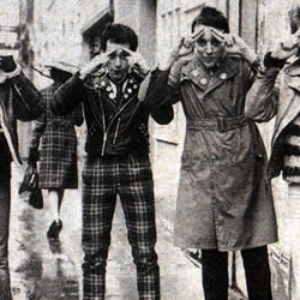 As part of the Misty in Roots People Unite collective based in Southall, west London, the band were active in anti-racist causes and played a number of benefits for Rock Against Racism. After a 27 year break the band reformed and are currently (2015) still giging, most recently support The Levellers whom will play at venues throughout late 2015. 100% cotton pre-shrunk jersey, 1/2inch rib knit collar. Side seam construction, seamless twin needle collar taped neck and shoulders, twin needle sleeves and bottom hem. Quarter turned to eliminate centre crease. Sedex approved supplier. Also available in kids.